Vietnam’ President Nguyen Minh Triet on Tuesday confirmed that Vietnam’s consistent position of supporting Palestinian people’s justice fight for basic national rights. 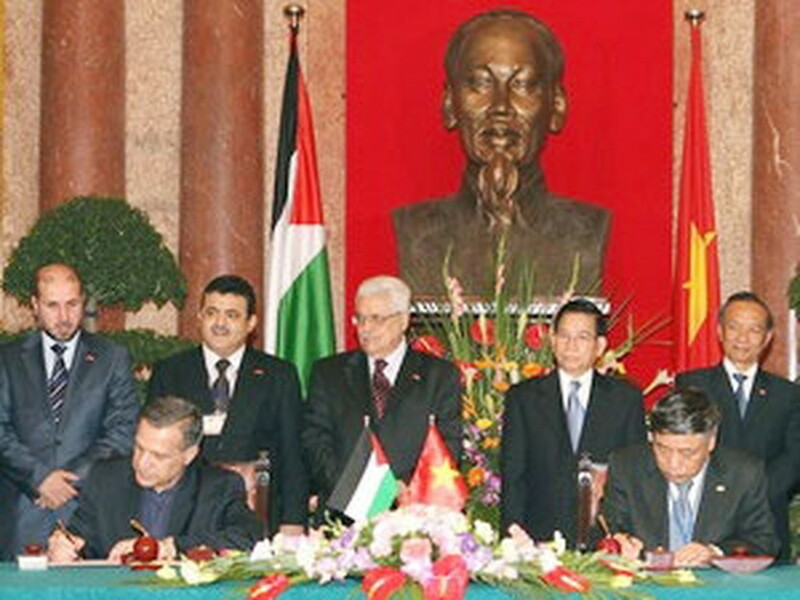 Vietnamese President Nguyen Minh Triet (2nd, R) and Palestinian President Mohmoud Abbas witness the signing ceremony of frame cooperation agreements between the two countries in Hanoi on May, 25, 2010. During the talk with President of the State of Palestine Mahmoud Abbas, who is visiting the country from May 25 to 27, President Nguyen Minh Triet also expressed the hope that Palestinian people to come together and strengthen national solidarity in order to achieve the final victory in the fight for establishment of Independent State of Palestine. Vietnam treasures enhancement and development of relations with traditional friends- countries in Mideast and Africa, among which is Palestine, said the Vietnam’s President. “It also is ready to share experience with Palestine and continues to offer advocacy and help to Palestine in its ability”, he added. Palestinian President Mahmoud Abbas expressed his gratitude to the Vietnamese people for firm support to Palestine. “Palestine would like to learn Vietnam's experience in building and defending the country”, Mr. Abbas said. On this occasion, Palestinian President Mahmoud Abbas invited Vietnam’s President Nguyen Minh Triet to visit Palestine. After the talk, the two Presidents witnessed a signing ceremony of frame cooperation agreements on economic, culture, educational, science and technology, sport and tourism. The two sides also signed memorandums on cooperation between ministries of foreign affairs of the two countries, agreements on educational and media cooperation. On the same day, the Palestinian President laid a wreath of flowers at Ho Chi Minh Mausoleum.